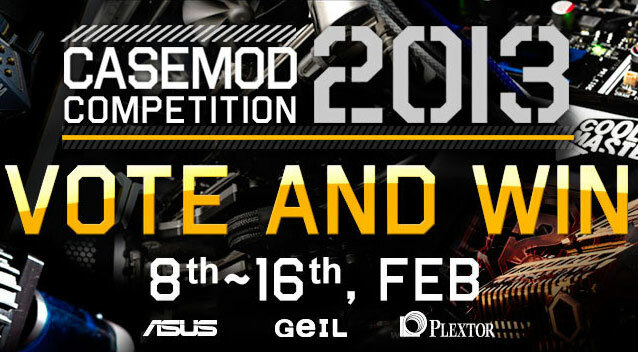 Cooler Master's Case Mod 2013 contest is currently under way and voting is open until February 16, 2014. Previous year's winners include Paul Tan's Titanium PC and Masbuskado modding's Opprezor. There are 31 tower-mod entries this year including two of our previously featured mods: Jim Weist's Grey Matter and Jesse Palacio's Centurion and there are also 48 scratch-built cases to vote from. Voters also are entered into a giveaway where they could win a Cooler Master V8GTS Cooler, a CM Storm Quickfire Ultimate Keyboard, a CM Storm Havoc Mouse, and a GEIL EVO Potenza 1866MHz 4Gx2 Kit. What are your favorite entries this year? Last edited by crowTrobot; 02-12-2014 at 03:58 PM.